A bird with a complicated taxonomic history, the brightly-coloured little vermilion flycatcher is a favourite sighting for many visitors to the Galapagos Islands. The little vermilion flycatcher is an endemic species to Galapagos and is closely related to the vermillion flycatcher found on the mainland Americas. The males have a striking red plumage, with black wings and eye markings. The females are much harder to spot with their comparatively drab grayish colour and peach-coloured breast. 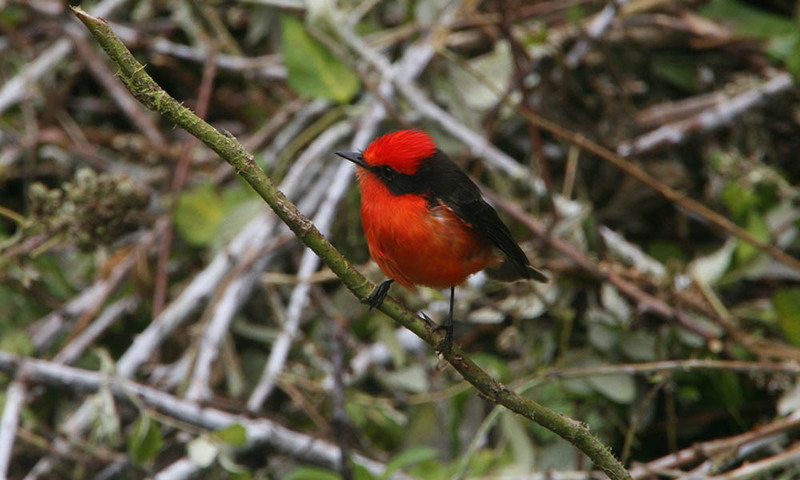 The vermilion flycatchers of Galapagos are slightly smaller and duller than their mainland counterparts, however in Galapagos the male vermilion flycatcher is the only truly bright land bird. Like all flycatchers, they feed on a variety of insects, often snatching them and feeding on the wing. Their typical habitat is Scalesia, Tournefortia, and Zanthoxylum forest; these are the primary forests that have largely disappeared from the inhabited islands due to clearing for agriculture. Vermilion flycatchers are monogamous and territorial. They reach sexual maturity at two years and they display to potential mates by flying straight up in the air while chirping steadily. They breed during the warm season (December – May), building a cup-shaped nest high up in a tree, using mosses and lichen as nesting material, and laying three eggs each year. The little vermilion flycatcher has had a confusing taxonomic history. They were first discovered in Galapagos during Charles Darwin’s voyage on HMS Beagle, and from Darwin’s specimens two endemic subspecies were identified: P.r.nanus, found on all islands but San Cristobal, and P.r.dubius, found only on San Cristobal. The subspecies P.r.dubius has not been recorded since the 1980s and is now considered extinct. Recently the little vermillion flycatcher was recognised as a full species P. nanus. Where to see them: Little vermilion flycatchers can be seen on the uninhabited islands of Fernandina, Isabela and Rabida. 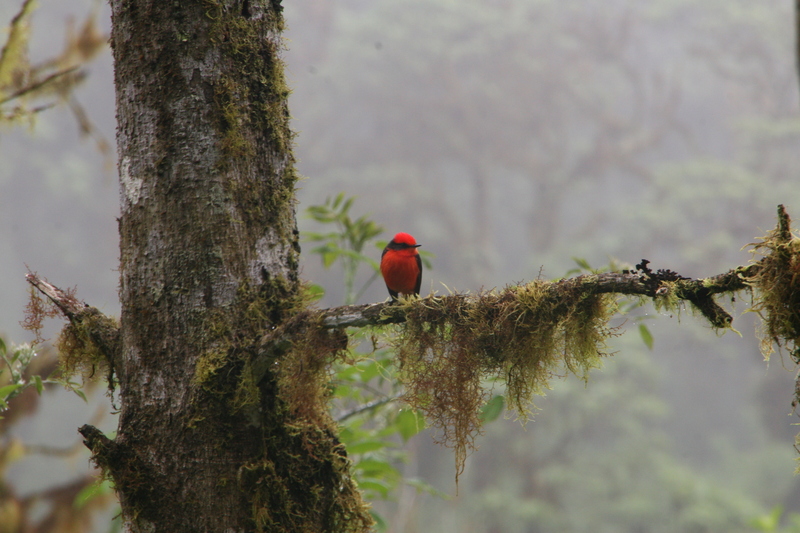 The greatest abundance of the vermilion flycatcher on the inhabited Santa Cruz is in the north and northwest side of the central ridge, where there is still a remnant Scalesia forest. When to see them: The best time to look out for vermilion flycatchers is during their breeding season, December to May, when there is an abundance of insects. Threats: The little vermilion flycatcher population is believed to be declining at a rapid rate, particularly on the inhabited islands due to the change in land use. Much of the forest habitat used by the birds has been cleared for building and agriculture. Other threats include competition from non-native birds like the smooth-billed ani, and parasitisation from the larvae of the introduced parasitic fly, Philornis downsi. Conservation action: Research is being conducted into the decline rates of the vermilion flycatcher on inhabited islands to discover the causes and to inform effective conservation strategies. Help us to protect the vulnerable species of Galapagos by donating today.